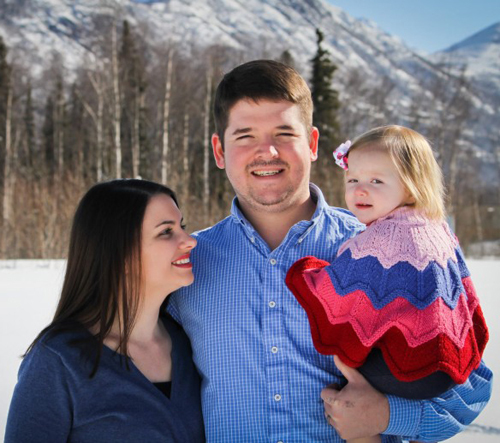 Our Kids Are Eating What? My sister and I had the opportunity to attend an end-of-year carnival at my cousins’ school last week. My aunt was helping out and invited us to come out and see everyone. 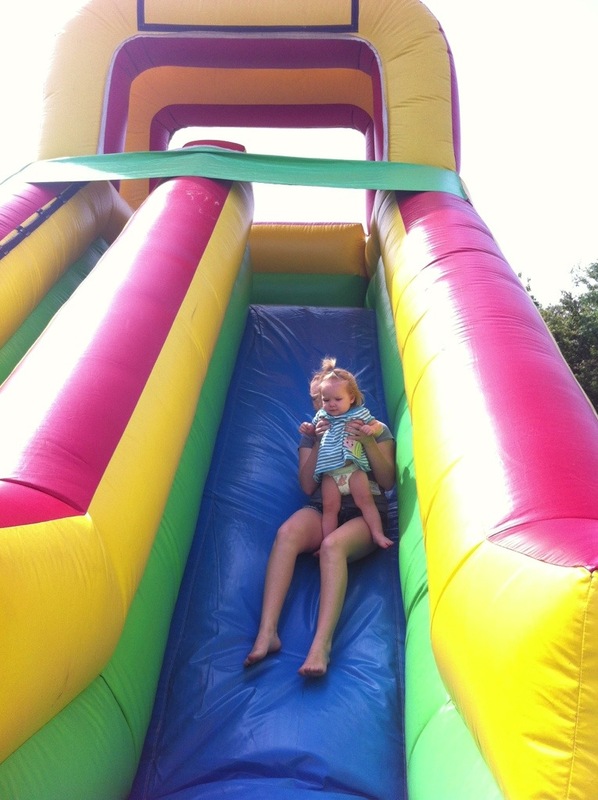 Ava had a blast with all of the kids and going down the inflatable slide with her aunt, Susie (or Suuusss-seee as Ava says it). She thoroughly enjoyed a snow cone (without the syrup), but wasn’t a fan of the fireman trying to spray her with the fire hose. While at the school, my sister and I were offered a school lunch. We graciously accepted, but our expectations were not high. I was even more appalled when I opened the bag. As Susie and I surveyed the bag, we determined that half of it was completely inedible. 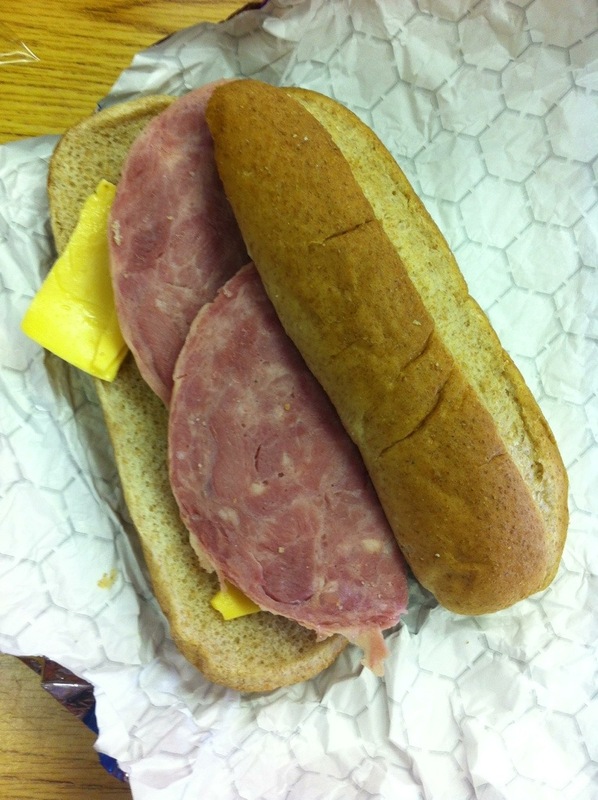 We unwrapped the “ham” sandwich and this is what we found. Although it is on what appears to be a whole wheat bun (whether it’s actually whole wheat, we may never know), the mystery meat “ham” made me want to vomit. Top that with two slices of processed cheese product and you have one completely unappetizing sandwich. Where are the veggies? Don’t the kids deserve some lettuce and tomato on their sandwich? Our bag also included one mayo and mustard packet, neither of which was going to save this sandwich. We weren’t even willing to eat the bread. Your choice of 1%, fat-free, or 1% chocolate milk. 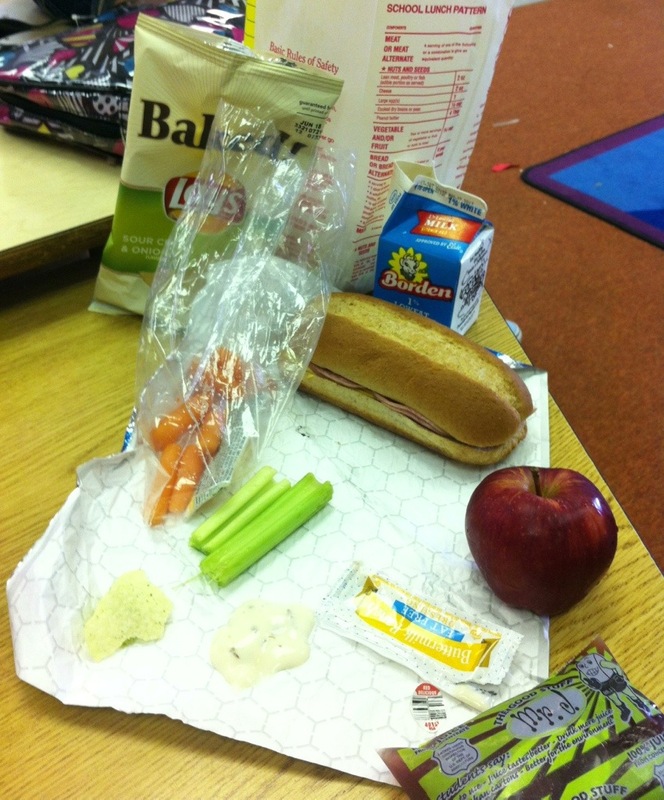 While I will applaud them for the apple and the carrots and celery, there are so many things wrong with this lunch. While I’m not a fan of processed food, the Baked Lays are a far better option than traditional potato chips. The carrots and celery are great, but why is it served with fat-free buttermilk ranch (that’s what they call it anyway)? Would you like to guess the first ingredient in this particular ranch dressing? It’s not buttermilk like the name would suggest. High fructose corn syrup is the first ingredient in the fat-free buttermilk ranch. Here’s the thing with “fat-free” foods (if you want to call them that), when you remove the fat, it must be replaced with something. That something is usually sugar; almost always in the form of high fructose corn syrup. So your children are having a side of sugar with their veggies (and GM sugar at that). Our bodies need fat! Young, elementary age children need the healthy natural fats (which should come from low-fat buttermilk in this case) for their developing brains. Give the kids some full fat buttermilk ranch dressing, their brains deserve it! Yay for the apple, but why is juice the go-to beverage for kids? Why don’t they offer the kids water? And wouldn’t water be less expensive too? As for the milk, it’s unnecessary (this is whole other topic in itself). But, if you’re going to offer kids milk, why 1% or fat-free? Let them drink whole milk or at least 2%. I think the absolute worst part of this is that more than 50% of this particular elementary school lives at or below the poverty level. For many of those kids, this may be their best, most nutritious meal of the day. For some, it may be their only meal. Many of the kids have said that the lunches are just not enough; they’re still hungry. Our kids deserve better. Do your children eat school lunch? Have you actually looked at what they are offered? This is officially our 100th Post! I put a lot of time and energy into this blog. Some days I think of 10 things I want to write about and other times I will go days feeling very uninspired. I’m okay with that. At any given time I have about 15 or so posts that I’m working on. I love hearing from you guys, whether it is here in the comment section or over on Facebook and Twitter. You are part of the reason I keep going. The other reason is that I truly enjoy this. 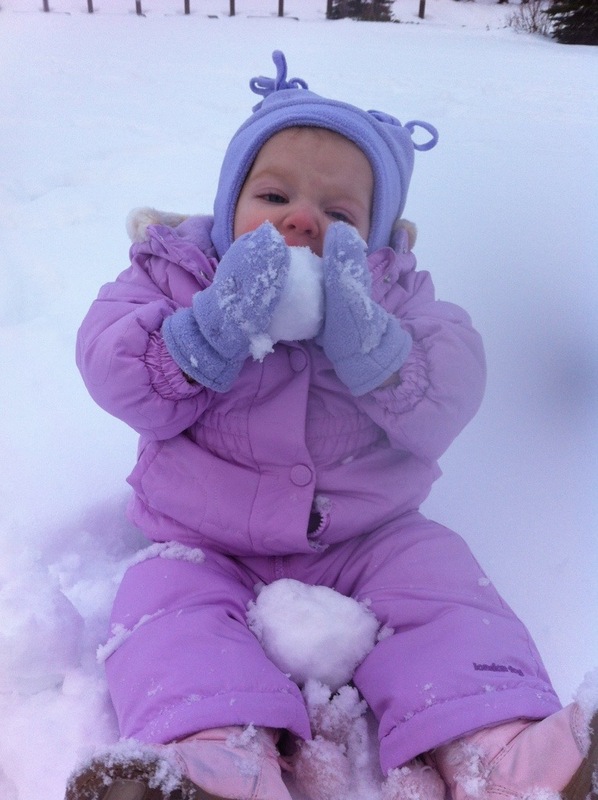 And although our blog doesn’t make much money (the amount is laughable), it is a part of our family. We will continue to share our adventures with you. I thought I would share our top 5 most popular posts out of our 100. They are listed in order. Our DIY Headband Holder. This was one of the first projects I posted here. Food Waste Friday! 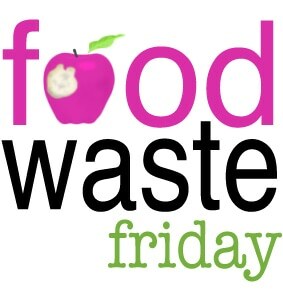 I am grouping all of the Food Waste Friday posts into one for this list because they actually held the next 4 slots. Our Picture of the Day from October 18th, 2012. 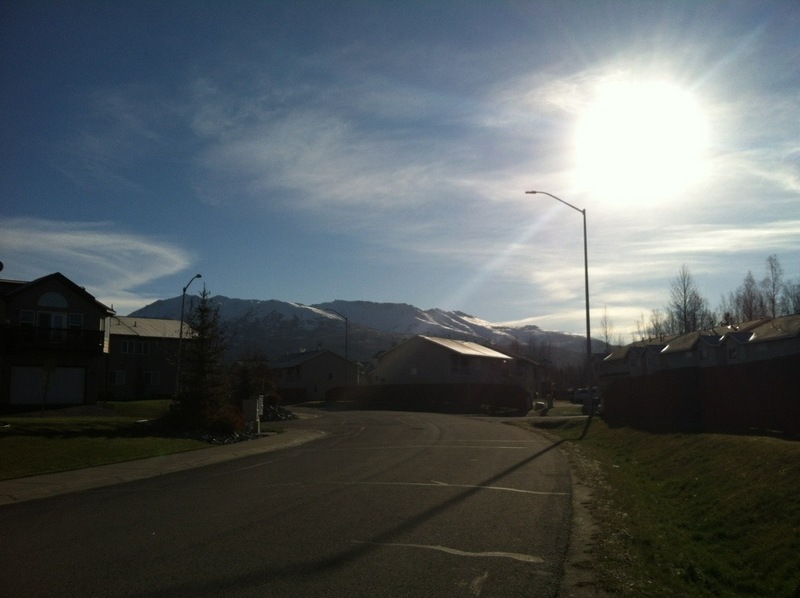 This was our first day in Alaska! I’m sorry for not posting a “Picture of the Day” more often. I need to make this a priority. 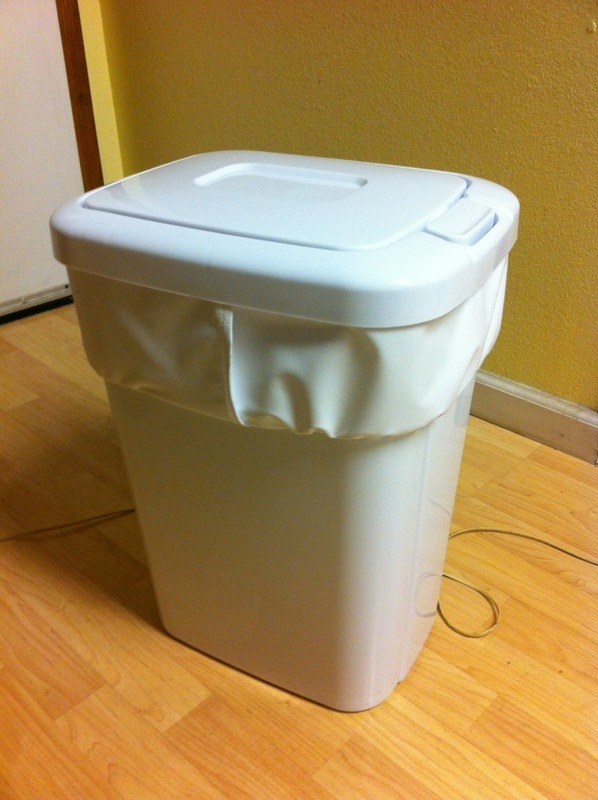 The DIY Cloth Diaper Pail Liner. 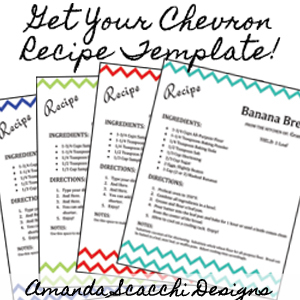 This project was super easy! Last but not least, our Afternoon at the Beach. Okay, it really wasn’t the beach, but it was equally fun! What would you like to see more of here at The Scacchi House? What wouldn’t hurt your feelings if it went away? I value your input! I am in the process of unlearning to double space at the end of a sentence. See. Right there. I have to stop and think about only hitting the space bar once. Supposedly, this is only required when using a typewriter. Since I have never used a typewriter, I’m trying to figure out why I was taught to double space in high school. Does anyone else still double space, or am I the only one?